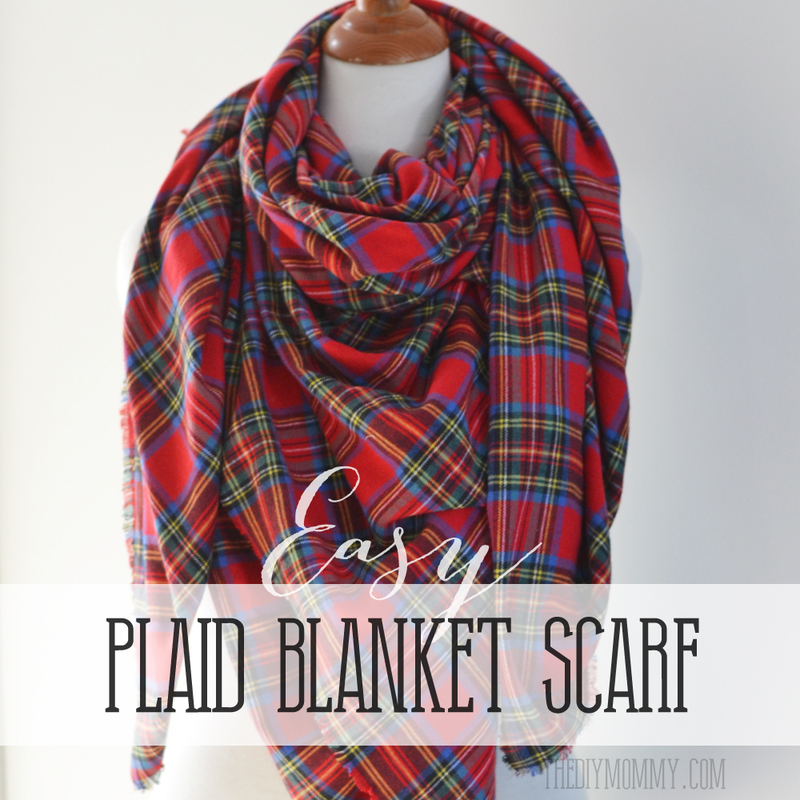 The second DIY scarf I want to share with you is a really easy no sew plaid blanket scarf. 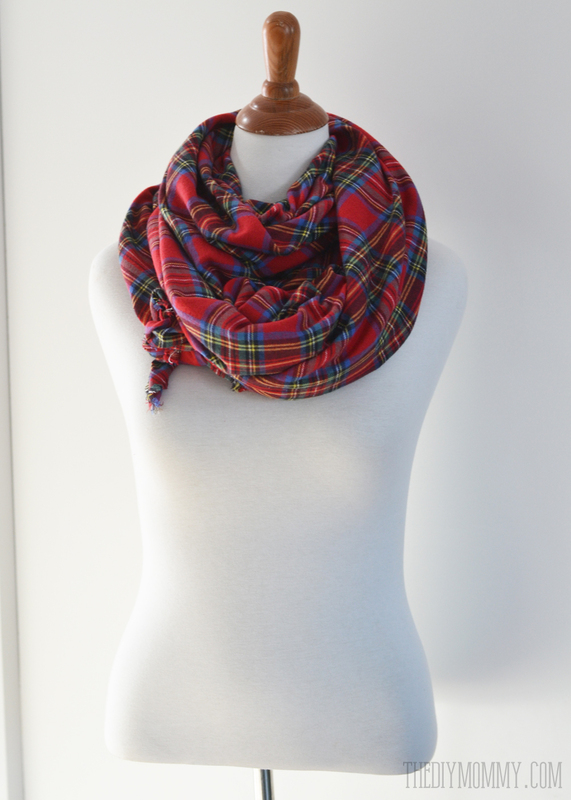 Blanket scarves seem to be a fashion staple this Fall & Winter, and I knew I HAD to make at least one of these this year. I really like how mine turned out and the best part is that I didn’t even have to use my sewing machine! 1 1/2 yards yarn died woven brushed cotton (or yarn dyed flannel) that’s at least 44″ wide. The trick is to find the right fabric. 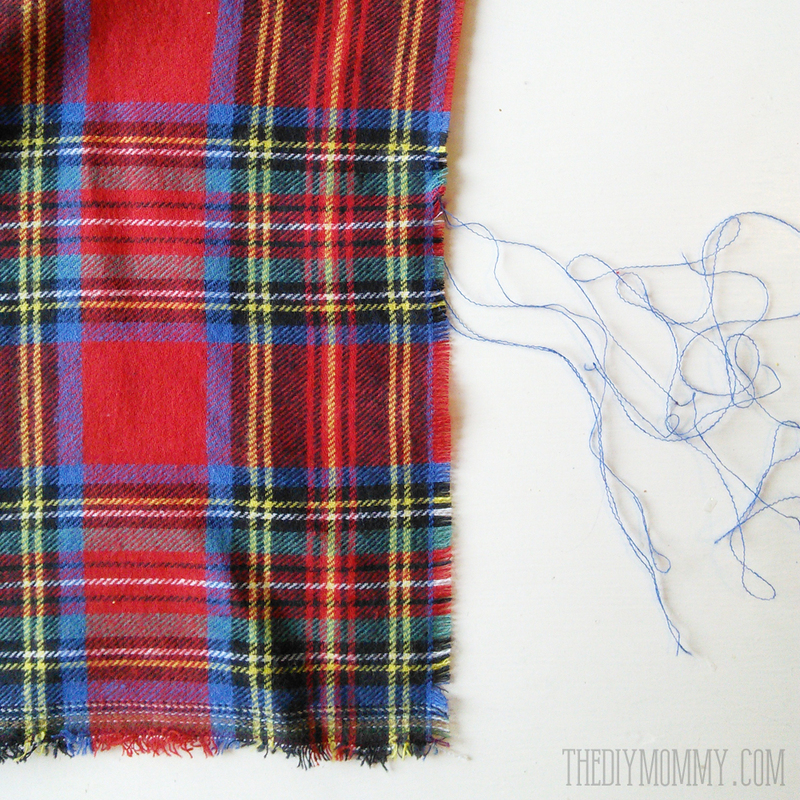 It has to be soft (so a brushed cotton or flannel cotton), the plaid has to be dyed all the way through the fabric so that it shows on both sides (“yarn dyed”), it has to be woven so that it has horizontal and vertical threads that can be pulled out to create a fringe, and it has to be at least 44″ wide to create a nice voluminous scarf. I found my fabric at my local fabric store, and it was called “yarn dyed brushed cotton”. 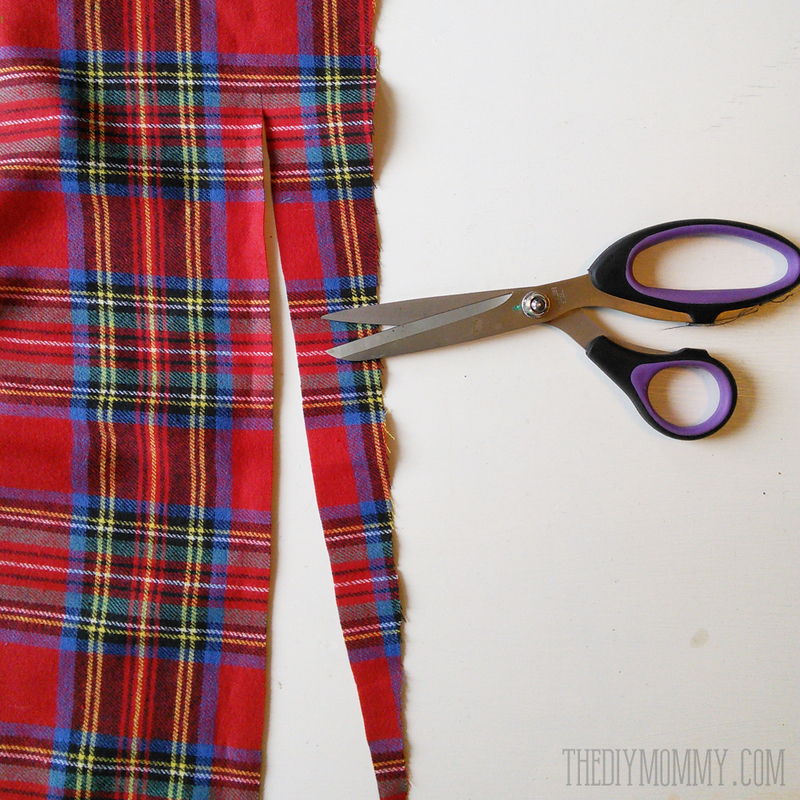 Cut your fabric into a large square that’s at least 44″ x 44″. If your fabric is wider, make a bigger square! 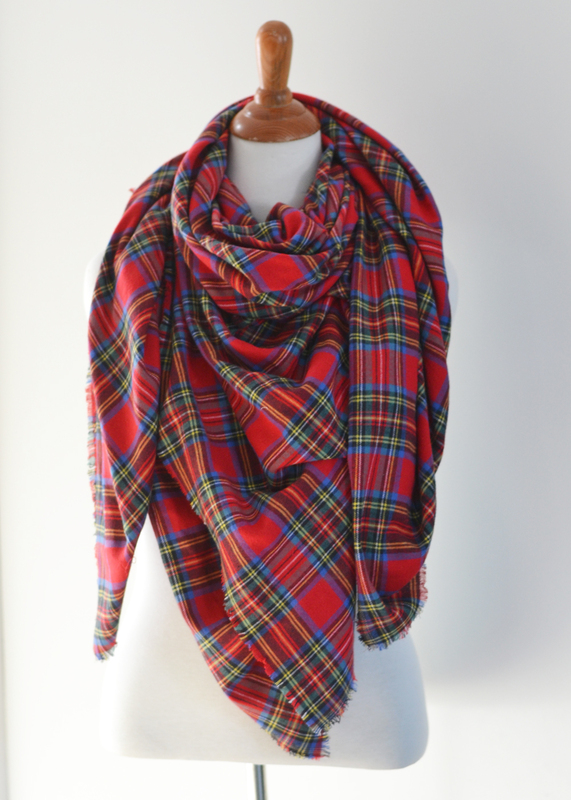 These scarves are lovely when they’re nice and large. You will be leaving the salvage edges alone (they’re the edges of the fabric that are already bound off & uncut). On the two cut edges, take a pin and pull out one or two of the vertical threads. Start pulling them out one by one (or two by two if your fabric allows it) until you create a fringe that is long enough to your liking. The fringe on my blanket scarf is about 1/2″ long. 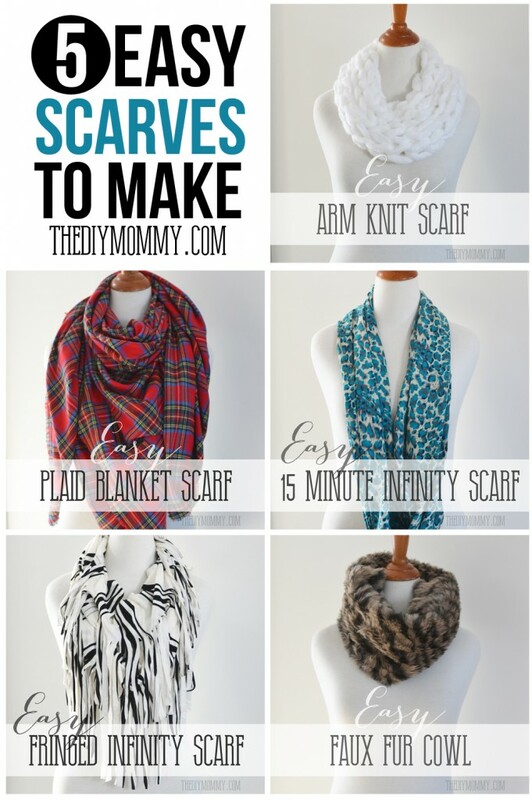 Or you can tie the ends together in a knot and wrap it twice around your neck like an infinity scarf. 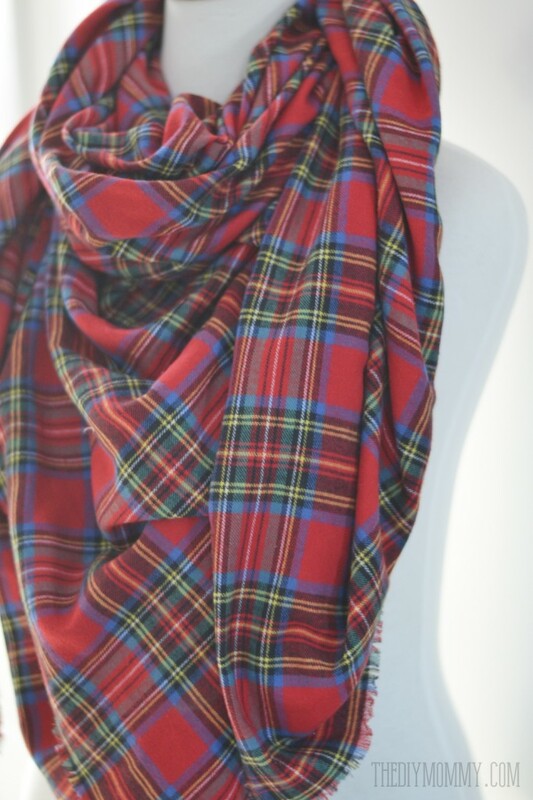 You could also use this scarf like an actual blanket if you’re out an about on a chilly day and need some extra comfort. I couldn’t possibly be more in love with this Christina! 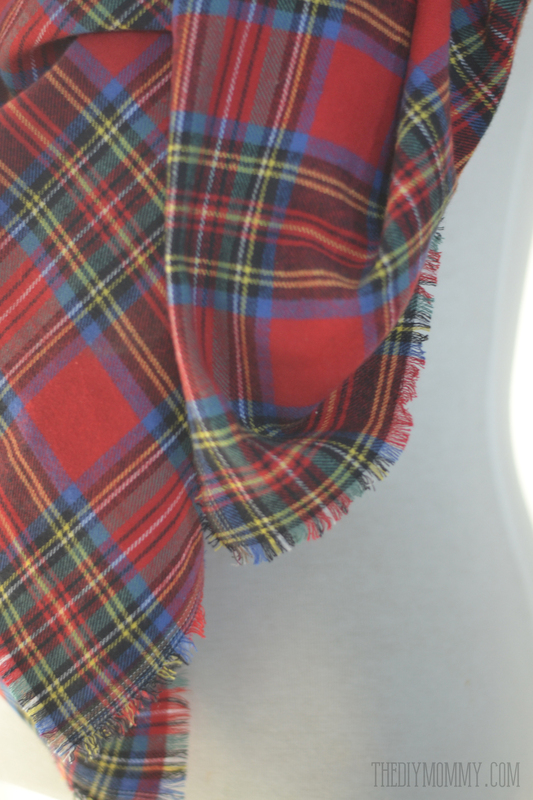 I’m off to order myself some of that fab plaid fabric too!!! I love this idea for simple and handmade Christmas gifts! Thanks for the inspiration! Hi! I just made a scarf using your pattern! So amazing! I made it 45 x 45 and can’t seem to tie it like an infinity scarf. What are the dimensions of the one you made? Mine is about 60 x 60″. I’m wondering what happens to the edges when you wash it. Does it fray even more? I plan to sew in tiny stitches far enough from the edge to allow fringing, all the way around the scarf before pulling threads to fringe up to it. This will help eliminate any fraying. Tiny stitches or even narrow zig zag; it will practically disappear when fringed. Mine hasn’t frayed any more, but to be sure you could certainly stitch or zigzag next to the fringe for security. I just decided I wanted to make a scarf like this and found your tutorial. After seeing prices in stores, I can’t wait to dive in and make several myself. I’m really needing a plaid fix. Thanks for the great inspiration. Thanks so much for visiting, Debbi! I’m glad you found this inspiring – I love making these for myself and as easy gifts! Should the edges be sown to keep them from fraying more? Hi there, do you think this would work with wool? How would you suggest doing the edges?